In industrialised countries, the increase in mean life expectancy together with a relative decrease in working time constitute favourable circumstances to start or to continue a physical or a sporting activity well beyond the age of 50 years. In industrialised countries, the increase in mean life expectancy together with a relative decrease in working time constitute favourable circumstances to start or to continue a physical or a sporting activity well beyond the age of 50 years. Since more than 20 years, there is even a real incitation based on medical and / or scientific recommendations which underline the positive effects on health of a regular physical activity during the whole life as opposed to the negative effects of a settled way of life (Paffenberger et al., 1986; Haskell, 1991). If it cannot be denied that a well conducted sporting activity can have beneficial effects for the body (Blair et al., 1992; Marks, 2006), it also cannot be denied that it can carry some risks. The notion of risk is present in any sporting activities, including in racket sports, and in most cases, for a given discipline, the probability of occurrence of an injury increases as the intensity of the practice increases on the one hand, and as the age increases on the other hand. In industrialised countries, the increase in mean life expectancy together with a relative decrease in working time constitute favourable circumstances to start or to continue a physical or a sporting activity well beyond the age of 50 years. Since more than 20 years, there is even a real incitation based on medical and / or scientific recommendations which underline the positive effects on health of a regular physical activity during the whole life as opposed to the negative effects of a settled way of life (Paffenberger et al., 1986; Haskell, 1991). If it cannot be denied that a well conducted sporting activity can have beneficial effects for the body (Blair et al., 1992; Marks, 2006), it also cannot be denied that it can carry some risks. The notion of risk is present in any sporting activities, including in racket sports, and in most cases, for a given discipline, the probability of occurrence of an injury increases as the intensity of the practice increases on the one hand, and as the age increases on the other hand. In order to help the players themselves and their physicians to better treat the specific injuries associated to each sport and also to prevent them, it is necessary to know the biological profile of the players, their physiological and biomechanical loads and the frequency of occurrence of each injury. When searching into the literature it appears that a great number of works have already been published about the physiological and biomechanical aspects of the different racket sports (badminton, squash, tennis and table tennis), mainly in young and / or in elite players. Concerning the pathologies connected to these four racket sports, practically all the publications deal with traumatic injuries, i.e. bone, joint, ligament and muscle injuries (Kibler and Chandler, 1994; Petschnig et al., 1997; Pluim, 2004). However data on cardiovascular events in racket sports and their prevention are very scarce (Northcote et al., 1986; Reilly and Halsall, 1994). Concerning table tennis, to our knowledge no study has ever been conducted to make an inventory of all injuries affecting players above 40 years (veterans). The few results presented here represent the initial step of an enquiry dealing with the different kinds of injuries found in veteran table tennis players in France. The main objective of this study is to define the risks profiles of older players in order to propose preventive measures, like in other racket sports (Chandler, 1998). In France, since more than 60 years, the practice of a sport in competition is controlled by a great number of official rules and laws which make it mandatory for each competitor to have a valid playing licence delivered by the corresponding national association, a medical certificate delivered by a physician, and an individual insurance. In the case of the French Table Tennis Association, each year a specific insurance contract is proposed to every player. The present preliminary enquiry is based on the consulting of the insurance claim reports collected during the 40 months period between 3rd January 2003 and 8th May 2006. Only the reports of injuries having occurred on the site of the practice (table tennis hall, and outdoor ground for training camp), and having necessitated a medical care have been taken into consideration. The incomplete reports, the broken glasses and the road accidents have been discarded. 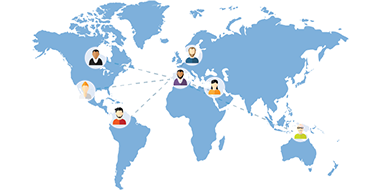 During 40 months more than 500 insurance claim reports have been received by the insurance company working with the French association. 441 players have been concerned by more or less serious injuries, and among them 142 (32 %) were players aged of at least 40 years (50.7 + 9.3 years, M + SD). There were 12 women (8.5 %) aged of 48.8 + 9.6 years, and 130 men (91.5 %) aged of 50.9 + 9.3 years. 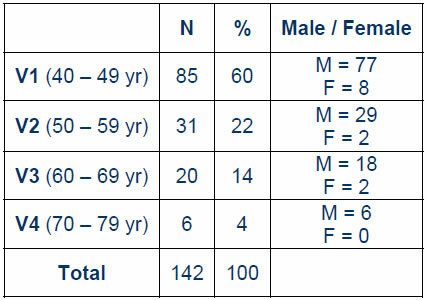 The distribution of the veterans according to their age category is given in table I. Table I: distribution of the veteran players according to their age group and gender. Among the 142 injuries, 125 were traumatic injuries, and 17 were cardiovascular events of which 15 lead to the death of the player in a few minutes (table II). 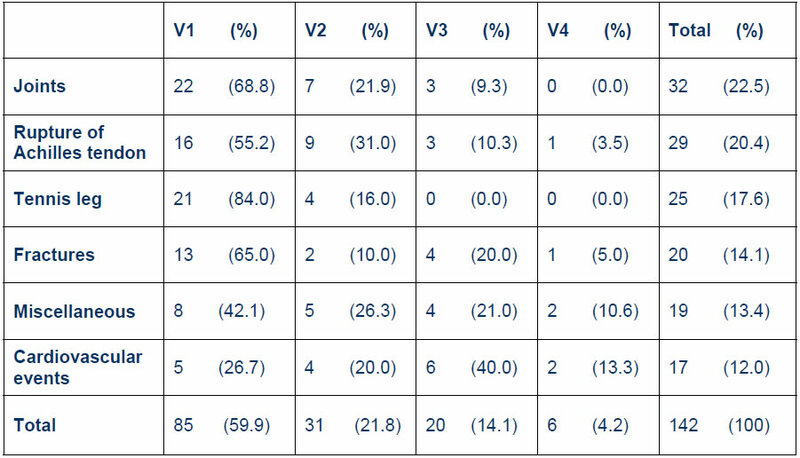 Table II: distribution of the different injuries in veterans according to their age group. The joint injuries (32) were mainly represented by ankle and knee sprains. There were also patella and glenohumeral dislocations, and low back injuries. Concerning muscle injuries (25), there were 21 partial ruptures of the gastrocnemius muscle (“tennis leg”) of which 1 in a female player, 3 partial ruptures of the tight posterior muscles, and 1 partial rupture of the biceps brachii muscle. The largest number of cases have been obtained with the rupture of Achilles tendon (29); among them, only 1 occurred in a woman. Fractures (20) have concerned elbows, wrists, ankles, feet and teeth. In the group “miscellaneous” there were 3 falls without serious outcome, 1 rupture of the patellar tendon, 2 short losses of consciousness, 1 cranial traumatism, and a dozen of minor injuries (bumps against the table or with a racket, etc.) All the fatal cardiovascular events have occurred in competition except one during a training session. A priori the practice of a sporting activity like table tennis offers different advantages: there is no direct contact with the opponent, and there are no heavy loads to move (in most cases the racket mass is comprised between 160 and 210 g, and the mass of the ball is 2.7 g). It maintains, and even improves, a sense of rhythm, the visual strategies, the eye - brain coordination, the reaction time, etc. (Ripoll, 1989). It develops the tactical sense. Moreover, being an indoor activity, it can be played the whole year round. All these factors make it possible to largely recommend its practice to many people and at any age. 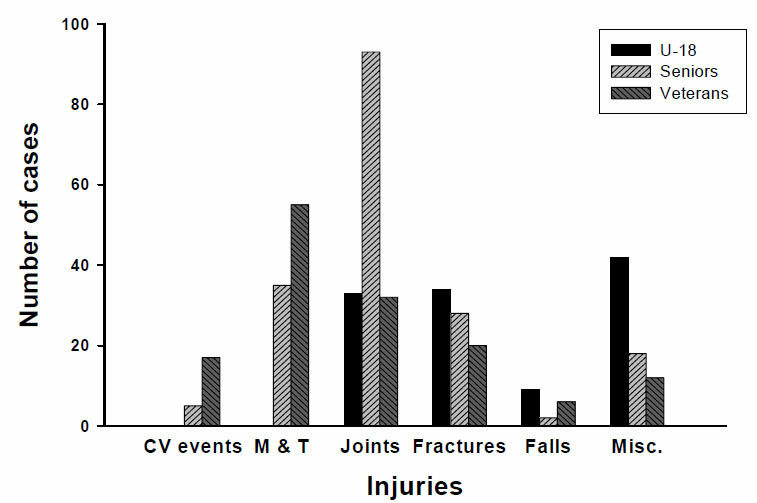 However the reality indicates there is also a probability of occurrence of more or less serious injuries, in particular in older players as the frequency of muscle and tendon injuries and cardiovascular events increases with age (Fig.1). One third of all injuries arose in players aged of more than 40 years (veterans) in a period of 40 months while this age group represents only one fifth of all players. Due to this clear tendency, it can be emphasised that many of these injuries, especially the most serious, can be predicted and therefore prevention can be developed. Figure 1: distribution of injuries according to the age category.M & T : muscles and tendons. U-18: under 18. - Muscle and tendon injuries: even with regular standard table tennis training (which means that more than 90 % of the time is spent to play) twice a week, the total muscle mass decreases with age and leg muscles become more fragile (Jansen et al., 2000). In case of loss of balance for example during a quick lateral step, which is a very common and frequent situation in table tennis, the leg muscle weakness increases the risk of fall. Besides, with age there is a decrease in muscle and tendon elasticity and an increased stiffness, and the couple “muscle + tendon” becomes more and more fragile. Since it is impossible for a player to control the intensity of the force generated by a given muscle group, especially the calf muscles during a sudden displacement of the whole body to try to catch the ball, there is a strong risk of total or partial rupture of either the gastrocnemius muscle or the Achilles tendon. In the present preliminary report in veterans, muscle and tendon injuries account for nearly 39 % of all injuries, and they have lead to a total loss of autonomy of the player of about 1 month, and a total temporary working disability up to 3 months in some cases. Even if, usually, the full recovery can be obtained, the personal and economical (professional) consequences are rather heavy. - Bone and joint injuries: it is well established that there is a progressive decline in bone mass of about 0.10 to 0.15 % per year until the age of 50 years. Beyond 50 years the reduction in bone mass increases especially in postmenopausal women. Even if it has also been shown that the regular practice of a physical activity could slow down, at least in part, the decrease in bone density, it cannot completely stop it (Copeland, 2004). The main consequence is the induction of bone fragility as people get older, which explains the high frequency of bone fractures (14.3 % of all injuries). They occurred practically exclusively during falls due to a less efficient control of the motor coordination and balance. In some cases however, the falls did not result in fractures but in joint injuries (22.8 %) such as ankle sprains or serious knee sprains (with rupture of the anterior cruciate ligament or of the medial collateral ligament for example). Again these injuries have been followed by a more or less long period of immobilization and a total or partial working disability period. - Cardiovascular events: even if they have been the less numerous (12.0 % of all injuries), they have been the more serious since in 15 cases out of 17, players have died within a few minutes despite immediate attempts of resuscitation. Not only the cardiovascular system cannot avoid the ageing effects, but in addition it represents the privileged target of several perfectly identified risk factors. These are gender (up to the age of 50 women are relatively less exposed than men), age, personal and / or family history of cardiovascular diseases, elevated levels of serum lipids (cholesterol, triglycerides), hypertension, diabetes, overweight, tobacco smoking. A settled way of life is also a well known cardiovascular risk factor; however in the present report all subjects had a physical activity. The reading of all individual insurance claim reports brought information only on two risk factors: gender and age. It appears that all cardiovascular events occurred in male players; their mean age was 59.0 + 9.3 years (range: 43 – 73 years). In one case, it has been found that one player who has died had an history of arterial occlusive disease of the legs. As for skeletal muscles, one of the consequences of ageing is the decrease in heart performances. Among others, it translates into a lowering of the maximal heart rate (HRmax) of which the mean theoretical value changes from 200 bpm at 20 years of age to 160 bpm at 60, according to the formula: HRmax = 220 bpm - age (years). From there on, the decreased heart rate during exercise is accompanied by a decrease in cardiac output, and thus by a reduced oxygen transport to the active muscles, including the cardiac muscle itself. The insufficient heart oxygenation can be worsen by an already existing hypertension, or in a player whose resting blood pressure is within the normal limits, by a sudden increase in blood pressure due to a strong and sustained catecholamine excretion. Such a situation is frequently found in players under pressure (high level of psychophysical stress) and who intensively fight in order to won a game (Baron et al., 1992). Moreover recordings made during play show that during a rally there is a sharp increase in heart rate and its value is close to the maximum. It is likely that these marked and uncontrolled reactions are at the origin of most cardiovascular events having occurred during play, either in competition or in training session. While the highest frequency of cardiovascular events has been found in the V3 group (6 cases), then V1 (5), V2 (4) and V4 (2), the age category the most concerned by traumatic injuries has been the V1 group whatever the kind of injury. A plausible explanation is that the "youngest veterans" (V1) were not totally conscious of their weakness in particular concerning their muscle capacities (decrease in mass and force) and their central and peripheral nervous system (decrease in coordination efficiency and balance) whereas they continued to play as if they were 10 or 15 years younger. Therefore it is possible that they have been more exposed than the oldest to the risk of a traumatic injury. Further to these preliminary observations, simple and efficient measures can be taken in order to limit the occurrence of injuries and even to prevent most of them. - The first measure is to impose that all players whatever their age and their level of play undergo a regular and systematic assessment of their health statute and physical abilities during a medical examination carried out at least once every year. In particular, the medical check-up must be oriented towards the detection of the different cardiovascular risk factors (see above). If an abnormality is detected, everything must be undertaken to explore it with the right means and to treat it with the appropriate drug(s), and when necessary the patient must be encouraged to modify his way of life (for example to lose weight, to stop smoking, et.). In most cases a regular physical activity is also recommended; however very often it must be of moderate intensity and it could be advisable to avoid any competition (fighting) spirit. The second measure concerns the maintenance of a good physical condition. Training must be carried out the whole year, with a progressive warm up and a cool down phase. The physical load must be adapted to each individual and certainly not of very high intensity. Since table tennis is characterised by a succession of short periods (a few seconds) of intense activity (as reflected by the increase in heart rate) separated by incomplete recovery periods, it is strongly recommended that players spent some time to develop or to maintain their endurance abilities through walking, running or cycling. In order to fight against the decrease in legs and back muscle mass and force, veteran players must be encouraged to regularly make strength training. During or just after an exercise, any unusual shortness of breath with regard to the exercise intensity and / or duration, or any other abnormal sensation (sudden dizziness, unexplained pain, suffocation, transient loss of vision, etc.) must lead to immediately interrupt the ongoing activity and to carry out a medical examination with the utmost urgency. And last but not least, it is necessary to have a balanced diet, a correct hydration (Evans, 1992; MacLaren, 1998) and periods of rest. In conclusion, an adapted practice of table tennis by veteran players may contribute to delay and to momentarily soften the negative effects of the ageing process. However it must be kept in mind that the probability of occurrence of a leg muscle / tendon injury or a serious cardiovascular event increases as age increases. Therefore it is recommended to detect and to treat the cardiovascular risk factors, to have a regular activity, including endurance and strength training, of moderate level without fighting spirit. Beyond 40-50 years of age, physical and sporting activities must be considered as factors of well being and not as factors of feat. Baron, R., Petschnig, R., Bachl, N., Raberger, G., Smekal, G. And Kastner, P. Catecholamine excretion and heart rate as factors of psychophysical stress in table tennis. Int. J. Sports Med. 13:501-505, 1992. Blair, S.N., Kohl, H.W., Gordon, N.F. and Paffenberger, R.S. How much physical activity is good for health? Ann. Rev. Pub. Health. 13:99-126, 1992. Chandler, T.J. “Conditioning for tennis: preventing injury and enhancing performance”, in Science and Racket Sports II (eds. A. Lees, I. Maynard, M.
Hughes, and T. Reilly), E & FN Spon, London, pp. 77-85, 1998. Copeland, J.L. Anabolic hormones in aging women: effects of supplementation vs. physical activity. Can. J. Appl. Physiol. 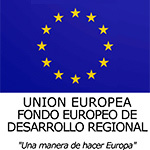 29:76-89, 2004. Evans, W.J. Exercise, nutrition and aging. J. Nutr. 122:796-809, 1992. Haskel, W.L. “Dose response relationship between physical activity and disease risk factors”, in Sport for All (eds. P. Oja and R. Telama), Elsevier, Amsterdam, pp.125-133, 1991. Janssen, I., Heymsfield, S.B., Wang, Z. Ad Ross, R. Skeletal muscle mass and distribution in 468 men and women aged 18-88 yr. J. Appl. Physiol. 89:81-88, 2000. Kibler, W.B. and Chandler, T.J. “Racquet sports”, in Sports Injuries, Mechanisms, Prevention, and Treatment, (ed. F. Fu), Williams and Wilkins, Baltimore, 1994. Marks, B.L. Health benefits for veteran (senior) tennis players. Br. J. Sports Med. 40:460-476, 2006. MacLaren, D.P.M. “Nutrition for racket sports”, in Science and Racket Sports II (eds. A. Lees, I. Maynard, M. Hughes, and T. Reilly), E & FN Spon, London, pp. 43-51, 1998. Northcote, R.J., Flannigen, C. and Btyne, D. Sudden death and vigorous exercise: a study of 60 deaths associated with squash. Br. Heart J. 55:198-203, 1986. Paffenberger, R.S., Hyde, R.T. and Wing, A.L. Physical activity, all-cause of mortality, and longevity of college alumni. N. Engl. J. Med. 314:606-613, 1986. Petschnig, R., Wurnig, C., Rosen, A. and Baron, R. Stress fracture of the ulna in a female table tennis tournament player. J. Sports Med. Phys. Fitness. 37:225-227, 1997. Pluim, B. “Physiological demands and injury in racket sports: differences and similarities”, in Science and Racket Sports III (eds. A. Lees, J.F. Kahn, and I.W. Maynard), Routledge, London, pp. 61-69, 2004. Reilly, T. and Halsall, D.L. “Physiological effects of squash participation in different age-groups and levels of play”, in Science and Racket Sports I (eds. T. Reilly, M. Hughes, and A. Lees), E & FN Spon, London, 1994. Ripoll, H. Uncertainty and visual strategies in table tennis. Percep. Mot. Skills. 68:507-512, 1989.